Standing in the background of the greenish pink neon Miami lights, the shark-nose coupé could be an archetypal example of the decade of synthetic pop and shoulder pads – the 80s. A car that was developed and produced in a country that no longer exists. 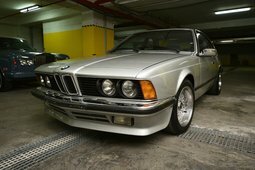 This is the BMW 6 Series, which was christened the E24 at the incubator of the Bavarian factory. It all started in the mid-1970s. The design of the CS and CSL coupés inspired by BMW's new look was then becoming a bit antiquated. Although they still didn't seem like a relic from the dawn of the car era, an innovative company like BMW couldn't afford to be even half a step behind the competition from Stuttgart or Detroit. It was therefore decided to come up with a silhouette for a new coupé – one that was more modern and subtly aggressive, and which would not leave anyone indifferent. After raising the body of the 3.0 CS a bit and modernizing the design, the new 6-Series left the cradle of the Munich factory in 1976, at first with two models: the 630 CS and 630 CSi. It is interesting to see the parallels between the "Beemerist" BMW of all time – the BMW M1 – and the E24's design. The same sporty lines, tempting you to dive in and feel the pleasure of the 2.8-litre engine with your entire body... Although despite the lines that were clearly inspired by the car's sporty forefather, the E24 is considered a Gran Turismo – a luxury car capable of getting from point A to point B much faster than a standard grey diesel. Speaking of luxury, the 6-Series had everything that car manufacturers had to offer at that time. Taking into account its year of manufacture, the 6-Series was fitted with things like leather seats (something that you have the best chance of getting, since the most were produced), power windows, air conditioning, an on-board computer, a sunroof, heated seats, ABS, a traditional BMW feature in the form of all four ventilated brake discs, and a three-speed automatic transmission (the standard version had four forward and one reverse). Although at the time it was a luxury coupé meant for owners of brick-shaped mobile phones who got rich on Wall Street, maintenance of the interior nowadays will not force you to take out a mortgage. For example, if you purchase one with a dashboard that has been damaged by time or the previous owner, you can easily replace it with an analogous part from an E28 5-Series model – both in terms of design and installation, there is hardly any difference between the two. And the instruments themselves are the traditional BMW style – you'll never confuse them with any other brand. However, the most important thing in a car is not the speedometer, but the thing that makes it rocket like a Saturn V carrying astronauts to the moon. That means the engine, and this model had a range of nine power options: The 628 CSi model was equipped with a 181-hp, 2.8-litre unit pushing the BMW forward; a 182-hp, 3.0-litre motor was available for a relatively short period of time (1976–1979); the 3.3-litre 194-hp engine that was produced in 1976–1983 was mounted in the 633 CSi model; and then there was the 635 CSi's 3.5-litre 215-hp motor that was produced for the longest of all E24 engines – from 1978 right up until 1989, when the model was taken out of production. Despite the fact that the 6-cylinder M30 engine is amazing both flying down the German autobahn and as a lasting and reliable partner, it was still growing a bit old. Therefore, it obviously has some problems. The first problem would be the banal engine overheating due to a clogged cooling system. Changing the coolant regularly should help combat this. And if it doesn't – you should think about replacing the fan. Another problem is the crankshaft, which may decide to stop working. This can happen either because of a faulty lubrication system or loose bolts. For the E24, where the shaft emits strange sounds as if Britney was singing, this is best to avoid, since replacing them requires removing the cylinder head and can cost around EUR 3,000, or maybe even more. Actually, there was also another engine – we left dessert for last. This is the BMW M88, and the letter "M" does not bedeck these ambiguous numbers in vain. The M88 and was fitted to the 6-Series M edition – a car that, together with the E30 M, to this day makes its own metal heart throb as well as the hearts of many a car lover. And the thing that makes these hearts beat is speed. Conceding only to the M1, its ideological father, the E24 M6 had a top speed of 255 km/h, making it the second fastest BMW ever built. Compared with the standard E24s, which was already luxurious, the M6 had BBS wheels, a rear spoiler, colour matching side view mirrors and M badges. However, it wasn't just the badges that made potential M6 owners splurge. The 286-hp M88 engine could move the shark nose from 0 to 100 km/h in 6.8 seconds! That's almost two seconds faster than a standard 6-Series coupé: a 1986 6-Series could go 0–100 km/h in 8.6 seconds. Despite the fact that this car is popular among collectors today, quite a few were actually produced. The total number of E24s manufactured was slightly over 86,000. Of these, the 635 CSi made up the largest portion, with over 20,000 built in all. That means that if you're looking for one of these beauties for yourself, it's the 635 CSi that you have the best chance of snatching. And it will most likely have been produced sometime before 1985. An M version is every BMW aficionado's dream, but these cars grace the roads and please the eye much less often. Only about 5,000 were produced, and this is the reason for their relatively high value. As far as prices go, they vary considerably. Depending on the configuration and what is left of the car, you can buy a complete zombie for a few hundred euros, and the only thing you'll get out of it is ageing some 10 years trying to restore it. Or for EUR 10,000–15,000 you can feel like the king of the 80s. As for the M versions, things are a little more complicated – you'd have part with EUR 45,000–50,000 for an E24 M6 in good condition. 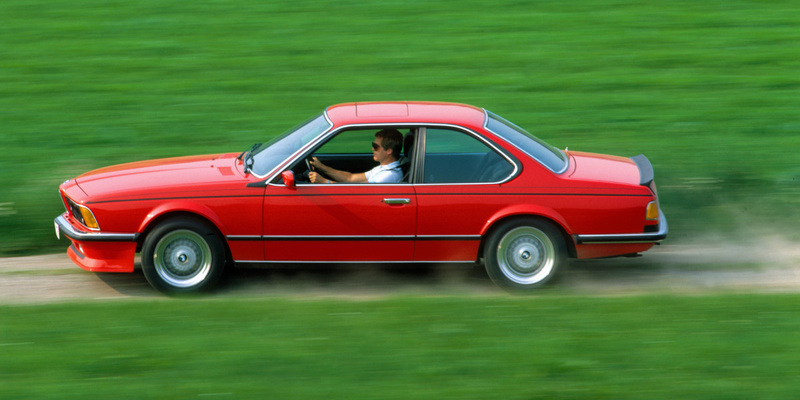 The E24 6-Series left the conveyor in 1989, and to this day is considered among BMW fans and automotive journalists alike to be probably the best looking post-WW II production BMW. As two Germanys were replaced by one that year, so was the E24 replaced by its ideological but indirect successor – the 8-Series. Waiting for a revival of the 6-Series took until 2003, when the world was given the 6-Series under the code E63.